222 men are registered for the start of today's men's race, so with just one start loop and before the 7 full laps it should be an "interesting" start. The sun is shining and it is dry and hot! Through the start loop and they seem to have gotten 1/2 way around with NO CRASHES and Florian Vogel (Scott-Swisspower Mtb-Racing) takes the lead. Lap 1: As they head out for the first lap, Lukas Flückiger (Trek World Racing) is at the front followed by Vogel, then Julien Absalon (Orbea) . Geoff Kabush (Team Maxxis-Rocky Mountain Bicycles) sitting low 20's. It took over 1 minute for the entire bunch to pass by the finishline to head out. Update: 4 riders were DNS: Liam Killeen (Specialized) , Torsten Marx (Ds-Rennsport), Luis Alberto Costa Leao Pinto and Filip Meirhaeghe. It is being reported that Filip Meirhaeghe wioll race his final World Cup in Houffalize next weekend and will then retire. Killeen is still suffering from a bad back. Lap 3: Across the finish to start Lap 3 now with a time of 33:31. 12 riders still togther. 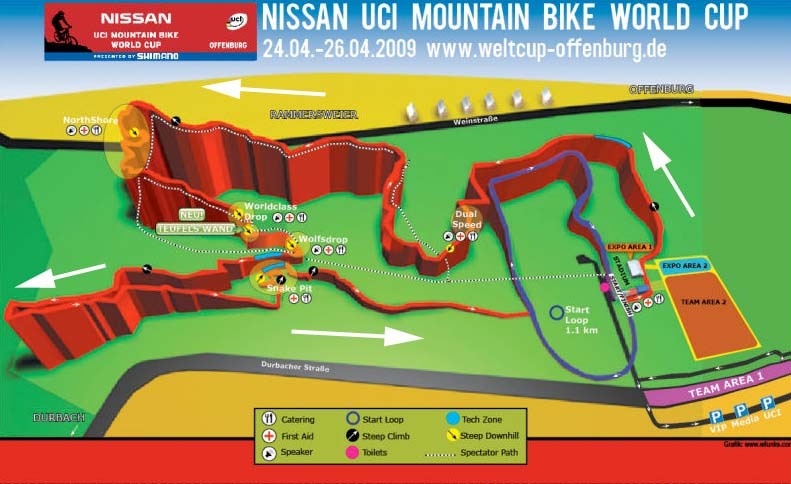 Absalon has attached on the climb. As he heads past the tech zone he has a 10 sec + gap on Flückiger , Stander, Sauser. The bunch is now well spread out as they chase. 9:20 am EST - Lap 4: As they start the 4th lap Absalon has a gap of 38 seconds on Jean-Christophe Peraud (Massi) leading the group of 8 chasers. Sauser, Vogel, Schurter, Paulissen, Stander, Fluckiger, Fontana. Wells and Hermida are at another 5 sec. Adam Craig is up to 15th and Kabush 17th. Hermida arrived onsite with a bad cold, said to have originated with his son. 9:32 am: Through the 'Snake Pit', Absalon has a gap of ~ 48 seconds on Stander followed by Sauser and Lukas Flückiger at 3 sec. Sauser update: He crashed on teh Northshore downhill section and broke off the brakes. Fixable? but would take too long to remain competitive. Lap 7: Absalon crosses to start the final lap. Kurschat and Perraud at 1:20. Stander at another 10 sec. Näf leads a group of 3 (Fontana and Flückiger) at nearly 2 min back.